This article deals with shopping for vintage pieces in actual, real-life bricks'n'mortar shops or markets first of all. We'll get to vintage shopping online soon (link at the bottom of this page). STEP ONE get out your tape measure and measure yourself. There's no avoiding this, sorry! Its no use knowing your modern size since older garments were produced to different sizing systems (or none at all!) The only truly reliable way to ensure a vintage garment will fit is to measure it and compare its measurements to your own. Your body measurements should be at least an inch or two less than the actual garment measurements for ease of fit, and even less for outer garments such as coats and jackets. Women will need the standard three at least - bust, waist and hip - but there are some other useful ones too. Consider the vertical neck to waist measurement which is critical in determining if a dress might be too short or long waisted. If you're shopping for trousers its helpful to know your thigh circumference as well as your inside leg - some 70s trousers, for example, were cut punishingly tight on the upper thigh! Be aware of high necklines, armholes, sleeves and cuffs which were often cut very tightly, especially in pre-1960s clothing. Men will need their chest, waist and inside leg measurements, but their neck circumference is also useful for shirts, which have been made using neck sizes for quite some time. Measure around the base of the neck under the Adams apple. Add half an inch to your actual measurement for the shirt size. If your measurement falls between sizes, always round it upwards - a tight collar is no fun at all. The sleeve measurement is important and should be measured on a bent arm: bend your elbow and place your fist on your hip, measure from the centre back of your neck to the crest of your shoulder (where the sleeve seam usually sits). Note that measurement and then continue measuring along the outside edge of your arm to just below the wrist bone. Note that total measurement too. Make a note of your measurements - in something you carry with you at all times. For some people this might be a notebook or diary, but these days its more likely to be a mobile phone (if you don't have a whizzy smart phone, you could save the information as a draft text message). STEP TWO - bring a tape measure with you when you go vintage shopping. I'll confess right now that I've never done this but I really wish I had sometimes! It would have saved so much wasted time trying on things that weren't going to fit, ever. And what about outdoor markets or carboot sales where there aren't any changing facilities? Having a tape measure would help determine if something is worth buying or should be left behind. I'm putting a small, retractable tape measure in my handbag right now. STEP THREE - Have an open mind. With most shopping expeditions the general advice is to have a list and stick to it. Forget that! Vintage shopping is entirely opportunistic. You might set out looking for a winter coat, but if you find a fantastic swimming costume that fits you like a dream, makes you look like Jayne Mansfield in her prime, and the price is right, buy it. You will NEVER find it again. OK, and then keep looking for that coat. Vintage shopping doesn't really follow seasons - its all about taking the long term view. Its pretty rare that the stars align and gift you with a treasure that was meant for you, so don't ever pass it up if you're in a position to take advantage of it. This applies even more to menswear. There's much less surviving vintage menswear than women's wear so your chances of finding anything that suits, and fits, are correspondingly smaller. Don't walk away from something that feels like it was made for you. You have to give yourself plenty of chances in vintage shopping, because there won't be any alternative sizes or colour options available. Everything is a one-off. Check over as much of the stock as you can before you venture to the changing room. STEP FIVE - how does it look on you? You've found a good potential buy - or maybe even a few if you're lucky - and established that the garment has a good chance of fitting you by checking its measurements against your own, so try it on carefully and assess it critically. Does the collar sit correctly? Are the sleeves the right length? Does it dig in or pinch anywhere? Does it gape or sag anywhere? Many of these issues can be corrected with a little judicious alteration, but while you can take something in that's a bit too big, you can't make small things any bigger! Don't ever force yourself into a vintage garment that feels a bit too tight. The seams (and sometimes the fabric) can't take the stress and the vintage trader will not thank you for damaging their valuable stock. 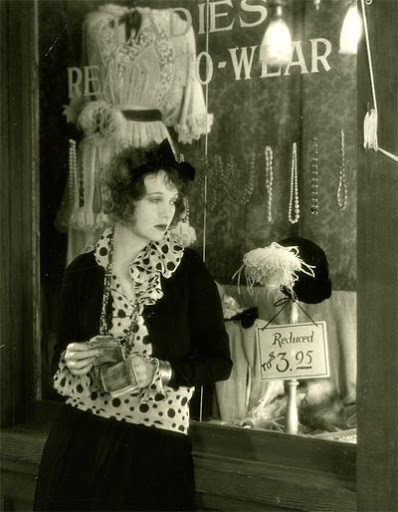 Corinne Griffiths in Outcast, 1928. STEP SIX - wait a minute! Don't buy it yet! Have you checked it first? You've found a fabulous garment, it fits and it looks great on you. You have it in your hands, no one else is going to buy it so take your time. You really mustn't forget to give it a really good looking over, no matter how excited you are about it. Can you look at it in good light? If you need to take it outside a dimly lit shop, offer to leave your handbag or wallet behind the counter - that should pacify any twitchy proprietor worried about you running off without paying. Check all over the garment for stains and damage. Pay extra careful attention to those danger points where the human body does the most harm to garments with sweat, dirt and wear - the collar, cuffs, armpits, and (sorry, but its necessary) crotch. Check all the seams, hems and edges. Check that all the buttons are there - if one is missing you are unlikely to find a match and may need to replace them all. Hooks and eyes, and press studs (snaps) are no bother to replace but zips can be a headache too. Then turn the entire garment inside out and check it all again, just as thoroughly. Then sniff it! I've read plenty of good advice about how to get rid of ancient BO, mustiness, mothball odours and so on, and I'm sure that sometimes they will work, but it takes some time and effort, plus there's a risk that you might damage your garment in doing so. Also, a faint smell often becomes a very strong smell with a warm body inside the garment. Bear that in mind! Another factor is the cost of maintenance: is it a washable, easy care fabric such as cotton or polyester, or will it need specialist dry-cleaning? This can be an issue for those on a tight budget. For shoes, make sure you check the heels, which are vulnerable to nicks and scratches, and the soles for any signs of cracking. Old rubber soles can dry out with age and lose their flexibility; leather soles can dry out too and become completely rigid. Hats - check the inner hat band, where the inside edge rests on the head. Sometimes this can get very grimey and greasy! STEP SEVEN - You should evaluate the garment, taking consideration of all of its qualities, faults and needs. If its a bargain, there's probably a reason why its so cheap - can you live with its flaws? Or will that little scorch mark near the hem always bug you? Everyone has their own tolerance level for flaws, and you have to expect a few with vintage items for the most part (here's why I am actually hesitant about 'perfect' pieces). Are you prepared to deal with anything that might need attending to, such as repairs, alterations, replacements or cleaning treatments? If its expensive, consider its age and rarity as well as its condition. Pricing vintage isn't an exact science, but there's nearly always a guiding logic behind it. In addition, consider what it might cost to buy a comparable modern item of the same quality, materials and workmanship (setting aside the age/rarity/uniqueness of a vintage piece) - this is often helpful for some perspective! What it all boils down to is - what is this garment worth to me? Sometimes you just know its 'right' as soon as you lay your hands on it, but if you're wavering or undecided it can help to go through these evaluations to help you make up your mind. This might seem like a long, drawn out process, but, believe me, accomplished vintage shoppers can assess pieces in seconds flat. Every find is a little victory worth celebrating, and it pays to take a little time to make sure you don't come home with something that might end up disappointing you. I love browsing for vintage, and even if I come home with nothing its always a great learning experience. You get to examine vintage items at your leisure, and you will soak up some valuable assessing skills without even realising it. The more you see and handle vintage garments, the more you will be able to recognise fabrics, styles and their approximate ages. Zuburbia's tips on shopping at vintage fashion expos or fairs (also applicable to outdoor markets, carboot sales and badly heated shops). Next: some tips about buying vintage online.